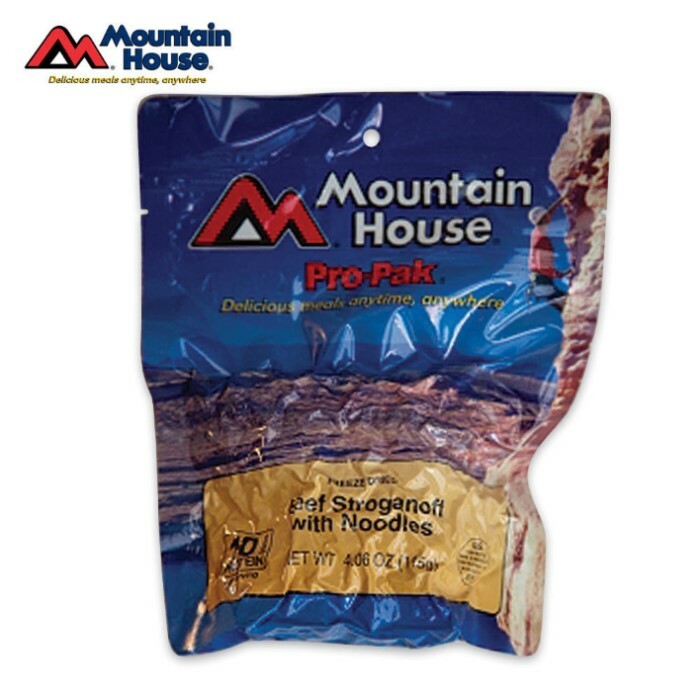 Mountain House Beef Stroganoff With Noodles Compact Vacuum Pouch 2 Servings | BUDK.com - Knives & Swords At The Lowest Prices! Mountain House makes stocking up on food easy with this compact vacuum pouch of beef stroganoff with noodles. This delicious beef stroganoff is made of beef, mushrooms and noodles smothered in a rich sour cream sauce. Simply add boiling water, stir, and in a few minutes you will have a wholesome, hearty beef stroganoff entrée for dinner! Best of all, you don't have to worry with messy pots, pans or cooking utensils; just prepare it right in the pouch. It has a suggested shelf life of 10 years, making it great for camping, outdoors and bug-out bags.